Mystique has a strong reputation in Budapest, with four games that have been well received. We missed out on playing the Egyptian experience (by all accounts the weakest), but the three we did play were very solid and, in particular, visually excellent. Time Travel, the Steampunk-themed room, was the stand-out game, and I’d recommend it be added to any enthusiast’s itinerary. Shogun’s Shadow was a calm and beautiful room that had reasonable puzzles but lacked a little excitement, particularly at the start. Cathedral, a fun medieval-themed room, was padlock-heavy but acceptably so and had plenty of good puzzles. There’s a reasonable waiting area so, if you’ve got a larger team, it’s a particularly good option. There are also a couple of VR escape games. Personally, while I found the one we played (Mind Horror) interesting, I wouldn’t recommend it. I’m not a big fan of crowded starts. Not because I object to squeezing in with my teammates (they’re lovely people) but because it usually means there’s not very much to actually do. This was a bit different, with at least a couple of things to keep players occupied, as well as the opportunity to see into the next space in the game. In fact, it would have been a good start to the game had it not been for a minor reset problem that left us trapped for a while feeling like we might not actually have solved the puzzle properly and trying to explain the situation over a walkie-talkie. That passed quickly, though, and we were soon on to a much larger space which we could explore. As you’d expect from a medieval-themed room, there was plenty of wood and iron around the space, and the lighting was relatively dim (although not so much as to make the game impossible). It definitely had the right appearance, and the cathedral theming would become more noticeable as we progressed. If you care about how your rooms look, I think you’ll be very satisfied. Puzzle-wise, I felt the game delivered too. In particular, there were several puzzles that involved physical interaction with the room, which is always a highlight for me. Be warned, though: there’s one particular puzzle that required an incredible amount of force to work on. At the risk of asking you to break the room, you should know it’s worth really bracing yourself if you think that something should cause an action but nothing seems to be happening. If you’re a search lover, then you should find plenty to entertain you too. However, if you’re not, you may find yourself frustrated. The game is all about collecting pieces of the builders’ plans for a new cathedral, and you slowly build up that collection as the game progresses. It’s a great measure of progress and, inevitably given that it’s a non-linear room, you’ll complete the game just after you solve whatever is the most challenging puzzle for you – whether that’s straight after a point of frustration or elation will depend on your team. For me it was relative elation, and we exited the room in 26 minutes without taking a clue. When I walked into this Japanese-themed game, I was immediately impressed. It was beautiful, capturing the quiet sense of calm that felt right for the theme while still carrying a certain sense of grandeur. It was the sort of space where you could have just sat in the corner and spent an hour chilling out. If there weren’t puzzles to be completed, of course. As soon as we started playing, the game showed its true colours. While on the surface it looked beautifully crisp, under the covers it had some rough edges. Most of the time, I don’t have a big issue with padlocks. They are, after all, what most companies use to create escape rooms so, if I didn’t like them, I’d probably have a different hobby. In some rooms, though, they just spoil the theme. Even then, you can usually get away with one or two, but here there were lots. They’d generally gone for different styles of locks so that we didn’t have to input the same code across a dull sequence of padlocks, but it still took some of the fun out of the game. The opening to the game was also relatively frustrating, with a series of challenges none of which really inspired me with their novelty or direction. Things picked up a little as the game progressed, with some fun physical interactions and enough puzzles to keep the four of us occupied for 25 minutes with just a single clue to help us along the way. The game finished as it started, on a high, with an interaction that was just the perfect ending. 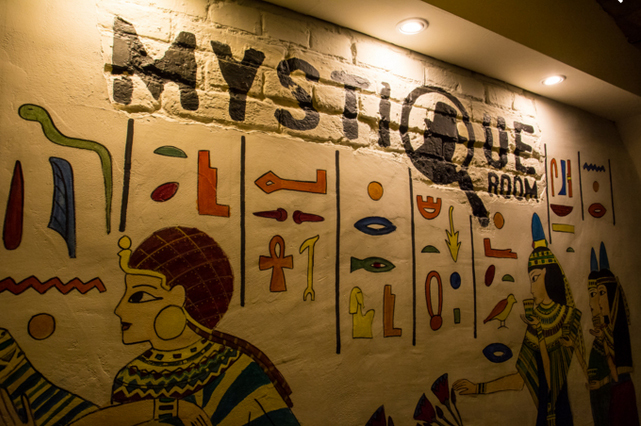 We were fortunate enough to visit Mystique just as they were finishing beta-testing their Steampunk-themed game. The game felt like a polished experience, but it’s quite possible they were still tweaking it to get the final version. You should therefore bear that in mind when reading through this review. Although I’d enjoyed the other two games’ aesthetics, this was the clear winner. There’s something about a steampunk theme which just seems to be particularly effective. Perhaps it’s that it lends itself well to physical puzzles, but there’s more than that. Maybe it’s just that the shiny brasswork attracts my magpie-like brain… Either way, this was a particularly fine example full of things to look at and investigate. Indeed, one criticism I would put forward is that there was so much to look at that it went one step beyond theming to red herrings. What it did do, however, was pack in plenty of puzzles, making use of all those props in a variety of interesting ways. Two of them were ones that I’d never seen anything quite like before, and one in particular was made on a much grander scale than necessary – they could easily have got away with something simple for the same effect, but they’d taken a path that made the experience that much better. There were hints during the game of some underlying story related to the creator but, disappointingly, they never really came to fruition. Similarly, the finale didn’t quite match up to the quality of the rest of the game. Having said that, it was still an impressive experience that I’d strongly encourage you to try out. Our team of five escaped in 37 minutes having taken a single clue.